Your dining table is where your family and guests gather to enjoy a meal together, so it should be inviting and suit your tastes and your space. When you’re looking to design a custom dining table, keep the following things in mind to be sure your design meets your needs and will be enjoyed for many years to come. What Type of Base to Use? 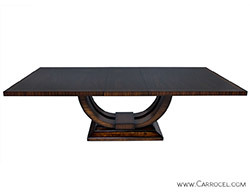 When creating your table, determining the type of base you want to use is an important stage in the design process. 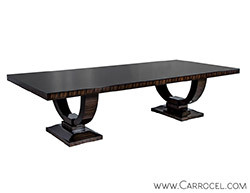 Generally, you can opt for a traditional four-legged table or select one with a pedestal base. If you’re selecting a table with legs, thicker and bigger legs on a small table can create a bold look. Any table over 7 feet in length will require bigger legs. You can also choose to go for a more elegant look with tapered, curved, or claw foot legs. There are also a variety of options for a pedestal base. You can select a single post, double post, X base, as well as some other choices. You can also choose to have a custom-built base made to your design preferences. What Size Should the Table Be? Custom tables can be built to the size you need. A simple way to determine the size of the table that you require is to lay out an estimate with painter’s tape or cardboard to see what suits your space and will seat everyone comfortably. Be sure to leave additional space around the table to accommodate dishes and space for everyone and leave room for chairs as well. 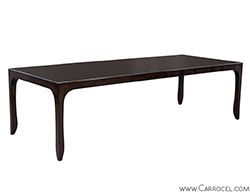 Do You Want a Formal or Casual Table? The finish and colour of your table will help to create a formal or casual look. 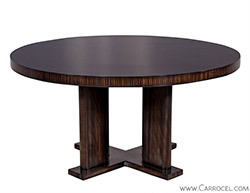 Rich, dark coloured tables lend themselves to a more formal setting. These may be best suited for separate dining rooms, or dark kitchens. Tables made from a lighter wood or stained lightly will suit a casual space, such as a breakfast nook or attached kitchen and dining space. Depending on whether you frequently have guests over for meals, you may require leaves to expand your table. They don’t take up much space on a regular basis as you can store them easily, but they add considerable space to the table, allowing you to seat more people. With leaves, you can also determine if you want them to be able to be added to the ends of the table or placed in the middle drop leaf style.